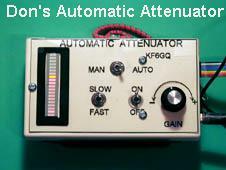 This device is programmed to give an indication of the input in a linear fashion. I program it into the Dot mode even though the signal strength seems to show in a bar graph. In the circuit the clock timer clamps the input at zero volts, then lets the signal charge a capacitor to the full voltage. This is done at a very high rate, so it is invisible to the eye. This shows as a series of lit led�s with the last one to be lit as the brightest. This is helpful at night to show the length of the display. Also during the time the signal is clamped to zero (gnd), the relative voltage going to the attenuation circuit is shown as a single brightly lit led. The setting of the attenuation level is set with a ten-turn pot, this could be a single turn pot, but the resolution of the one turn would be too abrupt. The S-meter comes into pot 3; this is used to trim the full-scale voltage of the s-meter so that it corresponds to full scale on the led meter. 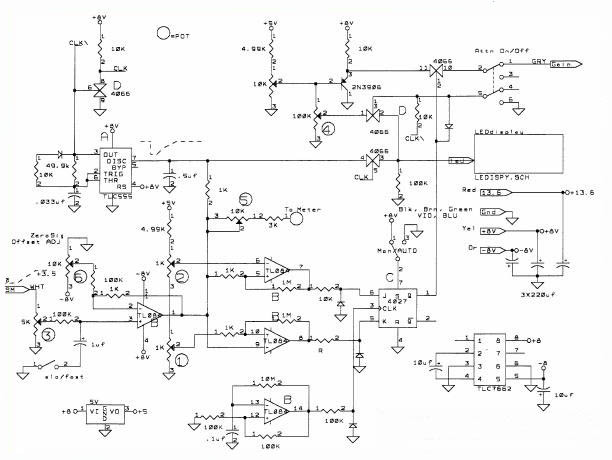 This goes to a buffer amp, so as to not load down the s-meter circuit in the 751. The buffer has another input, that is use to set the zero signal level at the first led. The output of this amp goes through a 1K resistor to an analog gate 4066 pin 4. Also it goes to the .5uf (.47uf) cap that is held to ground until TLC555 pin 7 lets it go (note: must use the CMOS versions of the 555 NOT the LM555). 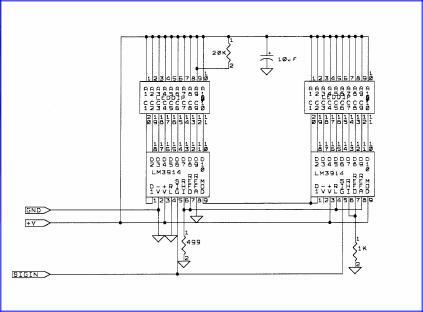 The output is /clk and also goes to a 4066 inverter to produce a clk signal. The attenuation control voltage is varied by the 10K 10-turn pot (not numbered). 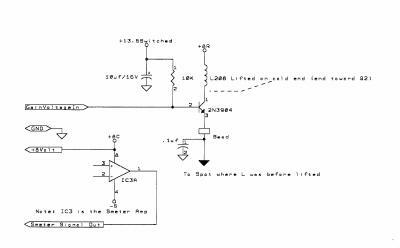 This signal goes through an emitter follower 2N3906; this signal goes to an analog gate 4066 pin 11. 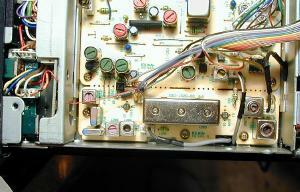 This gate turns off the attenuation voltage going to the 751, when it is not needed. The TL084 is a quad op-amp chip, one of the amps (pins 12,13,14) is used as a clock for the 4027-control toggle, and this clock runs at about 1HZ. The two other are used as level detectors. The lower one serves, as the point where the attenuator will turn off, and the upper one determines at what level the attenuator will kick in. In between the attenuation will stay as set. I set mine at about 15-20% and above 90%. The 4027 toggle will toggle to the state that these two level detectors dictate. Down in the lower right corner is a capacitive level converter that produces the negative voltages necessary for the proper operation of the op-amps. (Note: you might choose to use a rail-to-rail op-amp and maybe not need the negative voltage converter 7662). The buffer amp also can drive an analog meter through the pot 5 and 3K, if you want. Also on the input a fast/slow switch slows the signal down a bit when heavy modulation may cause bouncing of the s-meter. Okay, this is for the 751A Auto Attenuation Mods.